Justin Leonard earned $1.08 million yesterday. MEMPHIS, Tenn. » Justin Leonard made a 19-foot birdie putt on the second hole of a three-way playoff to win the Stanford St. Jude Championship in Memphis, the final PGA Tour event before next week's U.S. Open. Leonard, who turns 36 on June 15, beat Robert Allenby and Masters champion Trevor Immelman in the playoff for his 12th career U.S. PGA Tour title. He also won in Memphis in 2005. Kaneohe's Dean Wilson was tied for the lead after 14 holes but double-bogeyed 16 and 18 to fall into a tie for 13th. Justin Leonard won the Stanford St. Jude yesterday by beating Trevor Immelman and Robert Allenby in a playoff. 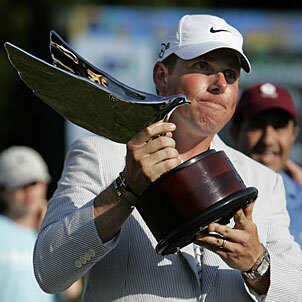 MEMPHIS, Tenn. » Justin Leonard thought he won on the final hole of regulation only to see his ball go left of the cup. Then he was a foot away from victory on the first playoff hole. Luckily, his ball rolled one last turn into the cup on the next hole. Leonard won the Stanford St. Jude Championship in a playoff yesterday, holing a 19-foot birdie putt on the second extra hole to beat Masters champion Trevor Immelman and Robert Allenby. Leonard blew a one-stroke lead with two holes left to drop into the playoff, but won on the 150-yard, par-3 11th when Immelman pushed his birdie attempt past the hole. "I don't think that ball would've rolled another half-inch," Leonard said. "It just barely got there the greens are so dry and fast." It's Leonard's 12th PGA Tour title, his second at TPC Southwind and his first since the 2007 Valero Texas Open - also in a playoff. He closed with a 4-under 68 to match Allenby (65) and Immelman (69) at 4-under 276, the highest 72-hole total since this event moved to the TPC at Southwind course in 1989. Leonard earned $1.08 million and now is fifth in the Ryder Cup standings with five Top 10s this year. He hasn't played in the Ryder Cup since 1999, when his 45-foot putt on the 17th hole at Brookline clinched the largest comeback in history. Leonard started yesterday tied for seventh and was one of 10 who had a share of the lead at some point in the final round. Leonard was the closest to a birdie on the first hole of the playoff on the par-4 18th only to come up a foot short. All three parred, sending the playoff to the island green at No. 11, where each had good shots. Allenby went first from 20 feet and missed a foot to the right. Leonard stroked in his putt next, the ball slowing near the cup to show off the Nike logo before falling in. Immelman, who birdied the last three holes of regulation to join the playoff, had the shortest putt at 11 feet to push the playoff to a third hole. But he just missed, giving the title to Leonard. RALEIGH, N.C. » Scott Gutschewski won his second career Nationwide Tour title, closing with a 5-under 66 for a two-stroke victory over Chad Ginn and Esteban Toledo in the Rex Hospital Open. OBERWALTERSDORF, Austria » India's Jeev Milkha Singh won the Bank Austria Open, parring all 18 holes in the final round for a 71 and a one-stroke victory over England's Simon Wakefield in the rain-shortened tournament. Singh finished at 15-under 198.